A new facility planned for Calgary will provide more than 100 affordable housing units for seniors and families with low income. Minister Sigurdson announced funding today for a new affordable housing project in Calgary. L-R: Craig Hill, co-chair, RESOLVE Campaign, Gary McNamara, CEO, Bishop O’Byrne Housing Association, Armando Valencia, affordable housing resident, Minister Sigurdson, Robyn Luff, MLA for Calgary-East. 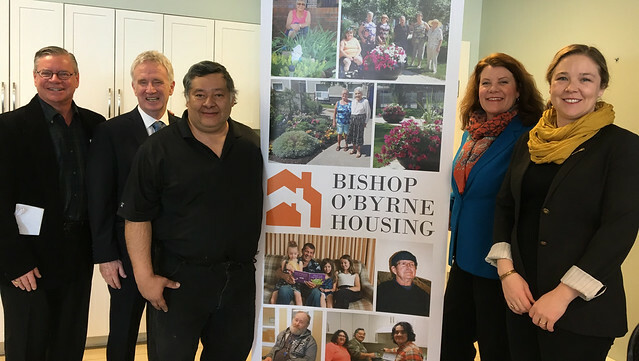 Seniors and Housing Minister Lori Sigurdson announced $6 million in capital funding for Bishop O’Byrne Housing Association’s Columbus Court project. The next phase of the affordable housing project will include a request for proposals. The housing provider anticipates the facility will accommodate around 250 vulnerable Calgarians and include one-, two- and three-bedroom units, a lounge, library and fitness facility. Columbus Court will also have a resource person on staff to help tenants connect with community services. As one of the nine partners of RESOLVE, Bishop O’Byrne Housing Association is accepting private donations to support affordable rents at Columbus Court. RESOLVE is a partnership of Calgary social service agencies that have come together with government to create affordable rental housing with supports for up to 3,000 vulnerable and homeless Calgarians. The total budget for this project is $24 million. Bishop O’Byrne Housing Association is halfway to its $6.8-million fundraising goal as part of the RESOLVE campaign that runs until end of March. Donations through RESOLVE will help provide lower rents and additional tenant supports at Columbus Court. Bishop O’Byrne Housing Association provides and operates non-profit residential accommodations for seniors and families with low incomes. They have eight properties in Calgary.